With the cooler weather heading towards the Woodstock area, now is a good time to winterize your irrigation system. Winterizing your system will help prevent freezing of any water that may be left in your irrigation lines or other parts that can damage to your system. From the mainline shut-off valve, turn off your irrigation system. Relieve pressure on the mainline by opening one of the system’s control valves from the control box or manually. Slowly open the manual drain valve. You’ll need to remove standing water from your valves either by disassembling the valves or blowing out the system with compressed air. To prevent repressurization, leave all the valves in the open position during the winter. This method is similar to the manual drain valve method. Begin by manually draining the mainline. You need to drain the automatic valves in the system since they remove water when the system is shut off. However, you’ll still need to disassemble the valves or blow-out the system with compressed air to remove any standing water. This method can be a little more complicated and if you do not know what you are doing, you could damage your irrigation system. You will need an air compressor that can supply 10 to 25 CFM of air volume. Never blow air through your system without a control valve being open. Shutoff the main sprinkler valve. Relieve pressure by slowly opening one of your zone’s manual shut-off handles. Locate the blow-out adapter and attach the hose from your compressor. Set the pressure on the compressor to 50 psi. Slowly increase pressure until you see all sprinkler heads in that line pop up. Don’t blow air through zone for more than two minutes. Switch compressor off to purge air from compressor and irrigation system. Turn next control valve on before turning off blown-out valve. Repeat these steps for each zone twice. Turn off system and disconnect the compressor. You’ll have to perform additional steps if you have a water pump connected to your system to properly winterize it. Make sure to always wear eye protection and refer to your irrigation system’s owner’s manual to determine which method is suitable for your particular system. 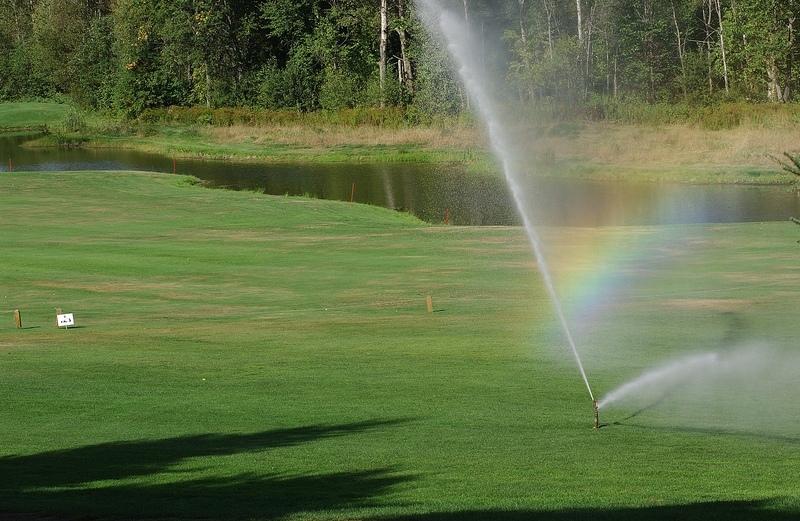 When in doubt, call Hutcheson Horticultural for expert service on your irrigation system.